That's it from our coverage of this extraordinary day. Most analysts and media had been expecting at least some small deal to emerge from the second round of talks between President Donald Trump and Kim Jong-un - perhaps a loose peace declaration (but the Korean War is still not over), or North Korea agreeing to close its Yongbyon plant (which instead will keep producing fissile material for nuclear weapons), or an agreement on sanctions (which will continue to stop North Korea from trading or interacting freely with the outside world). Instead, Mr Trump emerged with little more than nice words, saying: "Sometimes you have to walk and this was one of those times." The sticking point was sanctions, he said. "They wanted the sanctions lifted in their entirety and we couldn't do that." Thanks for following us today. We'll keep bringing you the latest news and analysis on the BBC News website. South Korea's president says it is "regrettable" that the talks failed, but that the leaders "have made more meaningful progress than at any time prior". 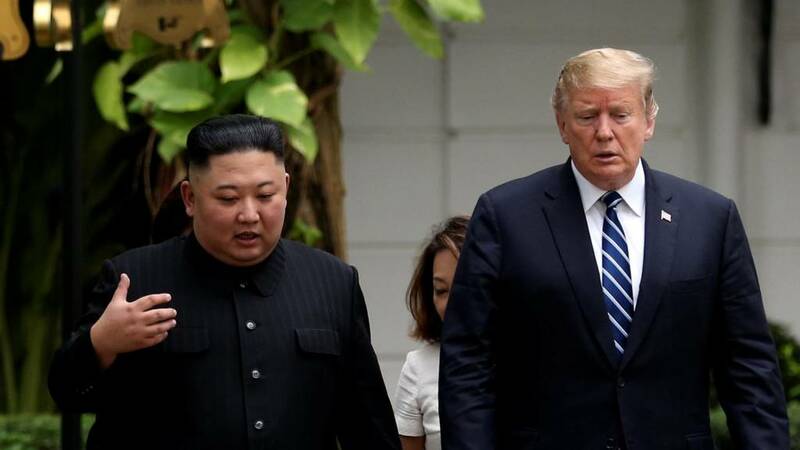 His full statement says Mr Kim and Mr Trump "expanded the scope and depth of their understanding" and that Mr Trump had expressed commitment to continuing talks. President Moon Jae-in says suggestions the discussions of sanctions relief shows the relationship has been "raised to a new level". The rather muted statement ends with hoping for "active dialogue" and says South Korea will help both parties "maintain momentum for dialogue". It would be fair to say this isn't the statement Moon Jae-in hoped to be sending today. One thing to remember amid all the debriefing is that we have not yet heard from the North Koreans. Mr Kim did not give a press conference like Mr Trump, of course, and it may be some time before we get a sense of how he and his delegation responded, or what their demands were of Mr Trump. We've had word that on board Air Force One Mr Trump is making his likely quite tricky phone call to South Korea's Moon Jae-in, a man who has invested much in rapprochement with North Korea. 'What comes next after this rollercoaster? Joel Wit, a former State Department official who has negotiated often with North Korea and now runs the 38 North research group has this take on the summit outcome. If you want to indulge yourself and read the full text of the press conference Mr Trump and Mike Pompeo gave after their unproductive talks, the people at Vox are one of several sites to have written it up. The North Korean leader is set to spend more time in Vietnam - and will begin an official two-day visit on Friday, the Vietnamese foreign ministry has said. Mr Kim is expected to tour economic sites to learn from the one-party communist state, which maintains extremely tight control and stifles dissent, while having a thriving market economy. What might Kim learn from Vietnam? The North Korean leader will then have a long train ride back home. It took him two days to travel to Vietnam. Jean Lee, former bureau chief for the Associated Press in Pyongyang, has tweeted that this was never going to be an easy meeting. North Korean media have been reporting this trip, but state TV was focusing on tree plantation efforts while the rest of the world's media were covering the news that the Trump-Kim summit ended early without an agreement. In any case - Kim Jong-un doesn't look too happy with that particular specimen. We've got the first response from South Korea - which of course is deeply invested in this process. The government says the failure to reach a deal is "disappointing" but adds that progress made was "more than ever". Several of you have asked us on Facebook about landmines and the DMZ. Victoria Telford asks: "Denuclearisation is likely to be a long slow process if it happens, but clearing the highly symbolic border zone of over a million landmines would be a huge peace-building step. It would be a powerful statement of peace to rid that area of landmines, especially if a humanitarian de-mining group were to do it. Is this on the table for discussion?" "North and South Korea have been working to de-mine small parts of the DMZ. Firstly to enable teams to look for the remains [of the war dead and others killed in the area] and also to turn the Joint Security Area - the area around the blue huts - into a tourist zone. "This is something they do alongside and with the permission of the UN Command at the DMZ. The hope is more of this work will take place between the two Koreas. But they don’t need Donald Trump’s permission for this." Air Force One has lifted off. Vietnamese officials at the airport are making the most of history and getting a quick group photo in front of Air Force One before it takes off. President Trump said he would call South Korea's President Moon Jae-in from the plane. That may be a tricky phone call. The BBC's Robin Brant, who's in Seoul, says the abrupt end to the Hanoi summit will inevitably knock the momentum Mr Moon has built with his enthusiastic support for the talks and closer links between the two Koreas. "The truth is that much closer economic co-operation is predicated on an end to UN sanctions, which we now know won’t happen soon. But President Moon will push on with plans to link up cross-border road and rail knowing he’s got what he wants most: a stable security environment. According to Donald Trump, Kim Jong-un promised no new nuclear or missile testing." Unexpectedly, there's been huge peak in interest in Otto Warmbier after his sad case was brought up at the press conference with Mr Trump. Lots of people are Googling his name wanting to know the story behind that question. Here's our story from 2017 on how a student trip ended in jail and death. Mr Trump is clearly not spending a minute more in Hanoi - he's at the airport now, saying goodbye to his Vietnamese hosts. We haven't heard anything from Kim Jong-un - so our understanding of what happened today is only based on what President Trump has said. But what will the North Korean regime tell its people? Now that we know that the sanctions on North Korea were the deal-breaker, what could Pyongyang do next? In his 2019 New Year’s speech, Kim Jong-un had said that North Korea could be forced to adopt a “new way” if the US did not lift sanctions. What that could entail is up for debate.